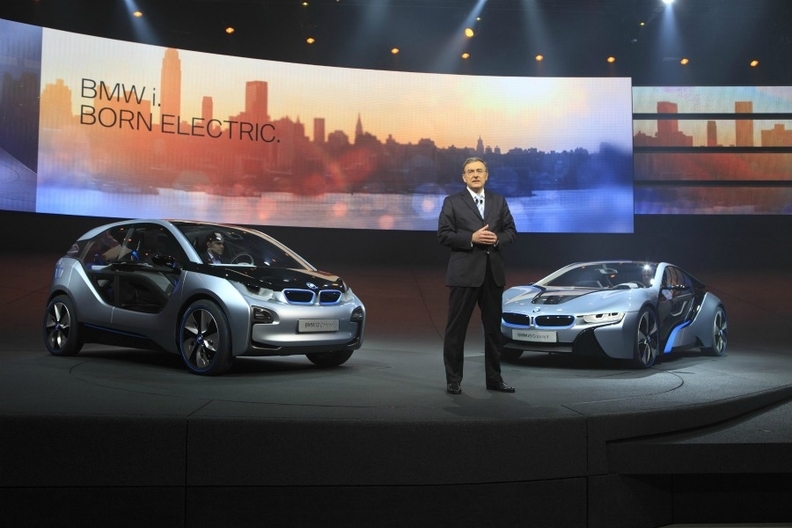 BMW CEO Norbert Reithofer presents the i3 (left), which will go on sale in 2013, followed by the i8 (right) in 2014. FRANKFURT-- BMW AG will give a new electric-powered city car a lounge feel with bench seats, naturally tanned "mocha brown" leather and hemp fibers in the floor covering to hold off Audi. BMW for the first time showed concept versions of the i3 electric city car and the i8 hybrid supercar in Frankfurt last Friday. 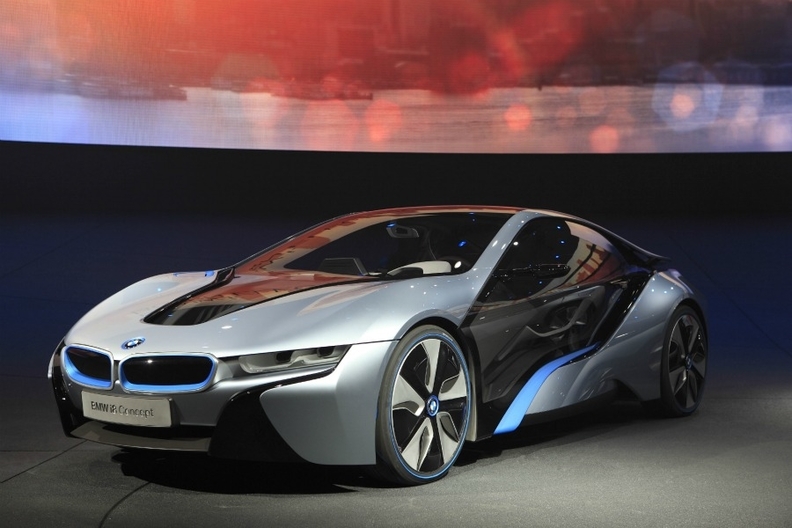 CEO Norbert Reithofer said the i8 will cost more than 100,000 euros ($143,000). The models, developed from scratch, will anchor BMW's new "i" sub-brand. "The majority of current electric vehicles are so-called conversions of traditional vehicles but conversions are always compromises," development chief Klaus Draeger said. "We wanted to bring e-mobility to the streets without compromise." BMW is betting that the 530 million euros ($756 million) investment to set up production of the vehicles will pay off in the race with Audi, which overtook Mercedes-Benz this year and has vowed to topple the Munich-based carmaker as the luxury-car leader by 2015. Initial volumes for the models could be in the "tens of thousands," with the potential to grow rapidly depending on market and regulatory developments, sales chief Ian Robertson told Bloomberg TV. "If the project is successful, it will give BMW an edge in innovation, which is a key attribute for premium car manufacturers," said Ferdinand Dudenhoeffer, director of the Center for Automotive Research at the University of Duisberg- Essen. "It would be a difficult situation for Audi." Both of BMW's electric cars are built around a carbon-fiber frame and an aluminum underbody to lower weight and consequently reduce battery costs. Investments for the project include a new carbon-fiber factory in the U.S. and a 400 million-euro expansion of its factory in Leipzig, Germany. 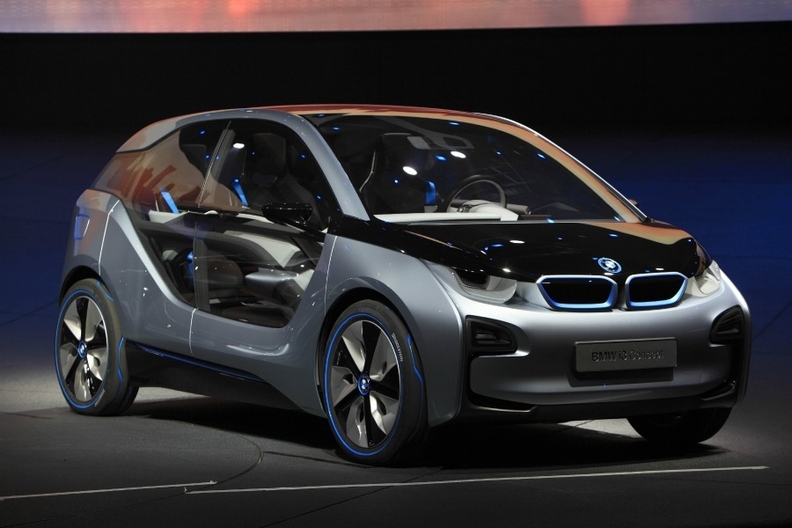 The i3 will go on sale in 2013, followed by the i8 in 2014. The four-person city car, which has a range of about 150 kilometers (93 miles), features narrower tires to reduce road friction and a faster charging system that can reload the battery to 80 percent capacity in an hour. That compares with more than seven hours for standard electric-vehicle chargers. The front and rear doors also open away from each other. The i8 plug-in hybrid combines an electric motor with a three-cylinder gasoline engine to accelerate to 100 kilometers per hour in 4.6 seconds, while getting more than 78 miles per gallon. It has a top speed of 250 kilometers per hour and can drive for up to 35 kilometers just on the energy stored in its lithium-ion power packs. Both cars have oversized windows on the doors. Audi's first electric-powered vehicle, the R8 e-tron sports car, will come to market at the end of next year as a limited production model, spokesman Armin Goetz said. Audi will test about 20 electric-drive A1 compacts in Munich later this year and is preparing for a similar project with the A3 in Shanghai. Audi aims to roll out its first serial production plug-in hybrid at the end of 2013 or in early 2014, Goetz said. BMW plans to offer versions with an on-board generator to extend the range and is considering other variants, sales chief Robertson said. The company will look to sell the vehicles using a mobile sales force and the Internet in addition to conventional dealers. The cars will be "relatively expensive" because of the large amount of technology in them, he said. BMW created the separate sub-brand, which will bear a BMW emblem with a blue ring around it, to market electric vehicles. The approach is in contrast to Audi and Mercedes-Benz, which plans to integrate electric vehicles into their overall lineups. The risk for BMW is the main brand's image of fuel-burning models could suffer by pushing the sub-brand too much, said Christoph Stuermer, a Frankfurt-based IHS Automotive analyst. "With a sub-brand, BMW risks creating a floating island around the mainstream products, but they're not going to make money on that technology unless they bring it into the mainstream products," Stuermer said. "The challenge will be to spread that technology, while maintaining the integrity of the core brand." BMW will use some of the technology in the electric cars in other models and the electric offerings will "support" BMW's target to generate a return on sales of 8 percent to 10 percent, CFO Friedrich Eichiner said.